Managing your website is hard work. Whether you do it on your own, or use a shared host or a small VPS, you’re bound to face technical issues from time to time. 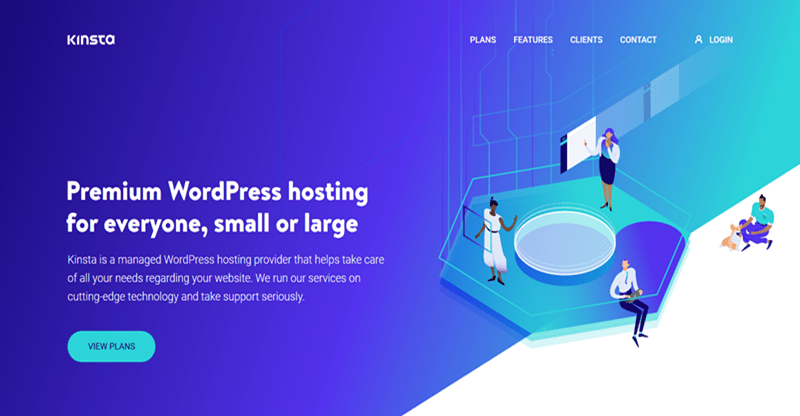 This kind of web-hosting is designed and optimized specifically for WordPress-powered websites to offer a hassle-free user experience. Managed WordPress is a suite of services that addresses all technical aspects of running WordPress websites. It offers benefits such as enhanced speed even during high traffic, hack-proof security, daily backup and restore options, automatic updates, zero downtime, a host of development tools, and expert round-the-clock support. This post will take you through some of the most reliable managed WordPress hosting providers along with the advantages and disadvantages of each. Pricing: $3.95-$11.95 per month under the Special Price plan. SiteGround has been consistent in its performance, innovation, and upgrades. Its features are especially favorable for WordPress, Drupal, and Joomla websites. The best thing about it is that it is officially recommended by WordPress.org. • Free Let’s Encrypt SSL for all plans. • PCI-compliance for ecommerce websites. • Can build multiple websites through a single account with 99% uptime. • Free backup and restore features. • Git integration, SSD drives, and CloudFare CDN. • cPanel interface and efficient server monitoring. • Comes with an anti-bot Artificial Intelligence system. • Automatic WordPress plugin updates. • 24/7 customer support via support tickets, live chat, and phone. • Limited data storage from 10GB to 30GB. • No discount offers for renewing contract, which can be costly. Pricing: $30-$900 per month with 30-day money-back guarantee. Kinsta is an outstanding hosting platform for ecommerce sites and large-scale businesses that need to stay live round the clock. It employs technologies such as PHP7, Memcache, Nginx, and Redis to ensure a speedy website. It is built with Next-gen infrastructure, which makes the installation process quick and your website user-friendly. • Free website migration and hack fixes. • Supports Let’s Encrypt, SSH, WP-CPI, Git, among others. • Multiple firewalls and security scanning features for optimal security. • 1440 uptime checks per site on a daily basis with automated backups on request. • Automatic scaling and quick SSD storage. • Provides sound staging and cloning environment. • 24/7 customer support through online messaging. • Disallows security, performance, backup, and caching plugins. • No priority customer support even for the most expensive plan. Whether you’re starting a modest blog or a multifaceted website, WPEngine can meet your requirements with its in-house Evercache technology for enhanced speed and scalability. This makes it a suitable platform for websites that want to manage rapidly growing traffic in a secure manner. WPEngine is a three-time recipient of the Stevie Award for best customer service. • Automatic and on-demand backup and restore options. • Free access to the Genesis Framework and over 35 StudioPress WordPress themes. • Includes CDN in every plan. • Restricts the use of certain themes and plugins. • Does not perform on non-WordPress platforms. • Receiving visitors higher than the set number and exceeding storage attracts additional charges. • Phone support comes only with the “Growth” plan. From basic necessities to advanced features, GoDaddy claims to fulfill every hosting service a website needs. Its servers are simple to manage and offer high speed as well as a range of functionalities. The servers also perform automatic WordPress core software and security updates. GoDaddy is particularly proud of its 4GH Linux Hosting. • Free domain and Microsoft Office 365 email with annual plan subscription. • Free SSL certificate for one year. • Detects and mitigates malware. • Daily backups and one-click restore options. • Access to thousands of free themes and plugins. • 24/7 customer support through live chat, phone, and community forums. • Detailed hardware specifications are unavailable. Pricing: $10-$1035 per month and $0.0139-$1.4375 per hour. As a competent PaaS provider, Cloudways wants to empower individuals, teams, and businesses of all sizes with the most seamless user experience possible. To achieve this, it offers an array of features at affordable rates. Its data centers are located all over the world. This ensures stability, security, reliability, speed, and overall consistency in performance. • Provides ease of setting up a new website on its server and installing apps with a single click. • Cloudways CDN provides higher website speed and quicker scaling. • Free site migration services. • Free Let’s Encrypt SSL. • Auto-healing features to mitigate site-crashing issues. • Dedicated firewall and two-factor authentication to prevent hacking attempts. • SSD-based hosting ensures a faster website with dedicated resources. • Does not include cPanel. • Requires a certain level of technical know-how for optimal use. • No email accounts or domain registrations. Pricing: $14-$229 per month. Custom pricing for enterprise sites. Websites: The Washington Post, Phenomblue, Streamlined Studio, Hive Digital. Flywheel offers robust hosting features that cater to everyone, from freelancers to large enterprises. However, it is especially suitable for designers, small business owners, freelancers, bloggers, and creative professionals. It provides high-speed and easy-to-use hosting services. With data centers located around the world, your website is sure to perform optimally regardless of where the user is. • User-friendly interface makes it the perfect platform for beginners. • Free SSL for every plan. • Unlimited page views or visits regardless of the plan chosen. • Comes with an optimized dashboard. • 24/7 customer support through live chats. You can also start a support ticket for raising hosting-related issues. • No shared, VPS, and dedicated plans. • Users cannot access SSH due to managed security and performance. • Users cannot buy SSL certificates (but can easily install them). • Phone support is available only for customers paying $250 (or more) per month. Liquid Web’s intent is clear: it wants to equip Web developers, designers, organizations, and other professionals at different stages of growth with advanced hosting solutions that enable them to create better products. It offers everything, from Cloud VPS to custom solutions. Its plans can support 10 sites and 50GB of SSD storage. • Daily automatic website backups. • Includes development tools such as SSH and Git. • Reasonably priced considering users can host 10 websites. • 24/7 customer support through live chat, phone, and email. • Price difference between data centers in different locations. • Lacks free backup quota (they are reasonably priced though). Pricing: $3.95-$120 per month with a 30-day money-back guarantee. This platform hosts over 2 million websites, which makes it one of the most popular shared hosting options. It is rated number one in web hosting for small businesses. Bluehost offers various hosting plans for beginners as well as large-scale businesses with round-the-clock customer support. Further, it is an official WordPress-recommended hosting provider. • Free domain name registration. • Easy one-click WordPress installation. • Built on VPS platform for improved speed and performance even in high traffic. • Highly secure as it includes SiteLock and SiteLock WAF. • Enhanced cPanel makes it easy to switch from shared to managed hosting. • 24/7 customer support through live chat, email, and phone. • Does not offer free site migration. • Users have less control over data backups. • Disallows the use of both, HTTPS and SiteLock CDN. Pagely is a premium managed WordPress hosting platform that delivers the goods your website needs. It works well for big businesses and large-scale enterprises. Its servers are optimized for high speed, fast response times, and on-demand scalability, among other functionalities. Users can look forward to server-level caching with Pagely’s PressCache, integrated CDN with PressCDN, and SPDY support. • Automatic updates for WordPress plugins. • Users can use any plugin or theme. • Plans support a large number of sites. • 24/7 customer support through ticketing. • Hosting plans are more expensive compared to other managed WordPress platforms. • Live chat is available only from 8AM to 5PM, Monday through Friday. No telephone support despite high pricing. Pricing: $2.95-$9.95 per month with 45-day money-back guarantee. Still in its infancy, FastComet has garnered a reputation for providing outstanding hosting performance and excellent customer service. It is considered a modern and promising hosting provider. It is one of the fastest platforms you can get for WordPress, thanks to its robust servers and development tools that fortify sites with the required technical support. • Its StartSmart plan offers free domain for life with unlimited traffic. • Users can buy a separate domain or an SSL certificate. • Provides strong security features like Web Application Firewall and malware removal. • With eight data centers globally, users always get the best performance. • No increased renewal fees. • A $19.95 setup fee is associated with the monthly plan. The only way to avoid this fee is to go for the one-year (or longer) subscription. • The StartSmart package allows users to host only one website. As far as WordPress is concerned, the best and the most secure way of hosting a website is through managed WordPress hosting. The good news is that there are plenty of high-performance and functional platforms to choose from. While their plans can pinch your pocket at times, the benefits you stand to receive are worth every penny you spend. Whether you’re a freelancer, a startup or a large enterprise, you will surely find a managed hosting platform that meets your requirements from among the options mentioned above.